Posted January 25, 2017 by Christopher Harris & filed under City News. Rebecca Hynek, now aged 28, lives with PTSD as a result of childhood trauma and her subsequent experience with the Royal Commission. She suffers constant breakdowns, has attempted suicide on a number of occasions and is regularly admitted to hospital. “I got into public housing after ending up in a refuge. Mental health break downs mean share houses collapse,” she tells City Hub. Hynek attends therapy twice weekly costing upwards of $800 a month. She receives government payments under the disability support pension to assist with the financial hardship brought on by her illness. In November 2016, Hynek received a letter from the Australian Tax Office claiming that she owed an unspecified amount of money to Centrelink for failing to comply with the earnings limit. “I couldn’t possibly have earnt enough in that time to get a debt,” she said. After receiving the letter, Hynek had a mental break down. She experienced suicidal thoughts and took herself to the Canterbury hospital emergency room where she said she waited for 8 hours. “The wait was so long that I got my friends to pick me up at 2am. It’s horrific to think about what would happen to me if I didn’t have that support network,” she said. Hynek is one of the 170,000 Centrelink clients who have received a debt notice since the controversial automated debt recovery system was set up in July of last year. The system compares Centrelink and ATO records to pick up discrepancies between earnings and payments. Both the Department of Human Services and Coalition members have claimed that the program has identified up to $300 million in overpayments to welfare recipients. Critics claim a large portion of these amount to “fake” debts. 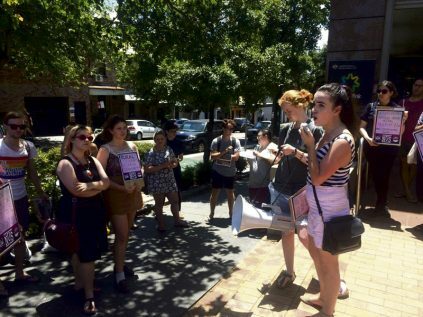 On Wednesday January 18, the National Union of Students organised a “snap protest” outside Redfern’s Centrelink Office calling for a “total scrapping” of this debt collection system. “There’s a lot of outrage out there about the fact that the government is targeting the most vulnerable people in society,” said Chloe Brafferty, NSW Education Officer. Brafferty, among others, are incensed by the fact that the onus is on the individual to disprove their debt. She says the only way to dispute the debt claim is online, a bureaucratic system that can take hours to complete. “The NSW Welfare office has been sent photos of screenshots of people’s phones who have been online for upwards of two hours trying to sort out their fake debt,” she said. Brafferty claims that welfare recipients are unable to walk into a Centrelink office to dispute their debt personally. “You can’t even dispute the letter by talking to a human being who might have some respect for the vulnerable situation you’ve been placed in,” she said. While the Federal government has recently announced plans to alter the process in the face of ongoing public criticism, Hynek is worried for others who have already received their letters. “I’m lucky enough that even though I get seriously unwell, I have insight. I worry about the other people who live in housing, they wouldn’t know they could contest a debt,” she said. Follow Charlotte on Twitter here.